For more detail on individual philosophers, click on the image above. 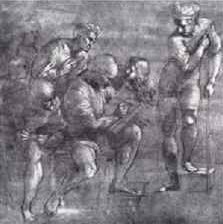 For analysis of Raphael's artistic conception and technique, click on the image below. The Mystery Surrounding the Fresco - Comparisons of Raphael's preliminary compositional sketches with his final working drawings, detailed physical examinations of the fresco itself, including those made during the restoration of the masterpiece unveiled in 1996, and various historical documents and letters, some of which, though no longer extant, are quoted or paraphrased in contemporaneous documents, all reveal that significant changes from the artist's original conception of his masterpiece occurred prior to completion of the fresco, in 1510, and after completion of the fresco, by a radical alteration which may not have been at the artist's own hand, in 1511. These changes point to mysterious tales of papal scandal, political intrigue, and mob violence stretching back to the fifth century C.E. For an insight into the mystery surrounding the fresco, click on the image above. School of Athens (Scuola di Atene) - Clickable The School of Athens, linked to individual philosophers. Raphael's Fresco of the School of Athens - From Columbia University's Masterpieces of Western Art. Stanza della Segnatura: Scuola di Atene - This site contains 21 images of The School of Athens. Stanza della Segnatura: The School of Athens - Nine details of The School of Athens in image viewer. The Philosopher as Hero: Raphael's The School of Athens - By Joseph Phelan, in Art Cyclopedia. 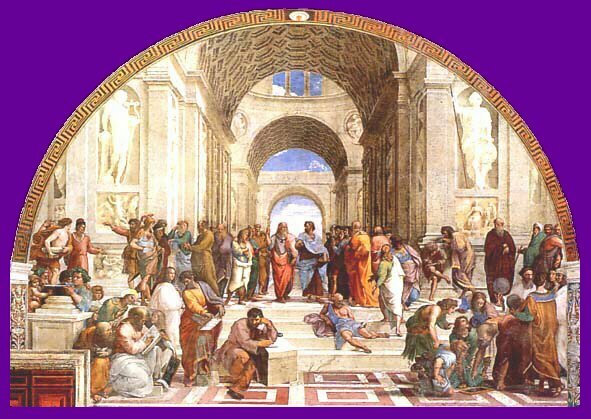 Raphael's School of Athens - By Silenos Socrates, in Library of AncientWorlds. L'Ecole d'Athenes: La transcendance et l'immanence - De montrer les voies de la Connaissance. Raphael, The School of Athens - The original clickable version of The School of Athens. Stanze e Loggia di Raffaello - Over 200 scenes from walls, ceilings, and arches by Raphael. Mark Harden's Artchive: Raphael - Biographical sketch and images with detail viewer. Web Gallery of Art: Raphael - Biographical sketch and images with image viewer. WebMuesum Paris: Raphael - A general site about Raphael. Raffaello Sanzio (1483 - 1520) - A general site about Raphael. Olga's Gallery: Raphael - Contains biographical information on Raphael. CGFA Carol Gerten-Jackson's Virtual Art Museum: Raphael - Biographical information and gallery.